This heavy-duty canopy tent is our toughest tent yet; thick aluminum construction makes it extra sturdy and the most durable. Pop-up canopy tents are an excellent way to advertise your business while protecting you from the elements at outdoor events. This is a standard 10 ft. x 10 ft. size with five different heights, the telescopic legs easily snap into place. The legs on the heavy duty model have a dense 48mm thick girth. The springs inside the frame add tension to the graphic for a perfect fit and form. The graphic is printed on special water resistant material with a UV-cured printing process that dries immediately even in the worst rain storms. 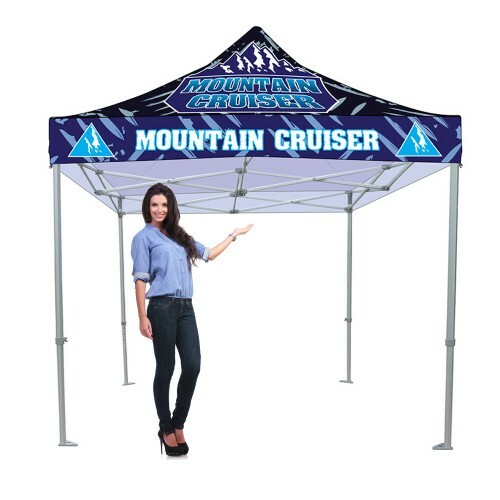 The printing on this heavy duty aluminum pop up canopy tent has shiny vivid colors for a professional look that attracts shoppers to your booth. A handy travel bag is included. Wind Speed Rating: The wind speed rating is 20-28 mph. Pop-up canopy tents are portable and quick and easy to set up in under 10 minutes! Back-walls: (118.75" w x 88 " h) - requires 1 rail per backwall. These can be single-sided or double-sided. They are fastened to the top of the canopy tent with velcro and secured at the bottom with a horizontal pole which spans the width of the backwall pole pocket and attach to the legs of the canopy frame. Backwalls can be assembled onto any side of the canopy. Sidewalls: (112”W x 47.5”H) - requires 2 rails per side rail (top and bottom) These can be single-sided or double-sided. They are fastened at the top and at the bottom with a horizontal pole which spans the width of the sidewall pole pockets then attach to the legs of the canopy frame. Sidewalls can be assembled onto any side of the canopy. Cases and bags: The 10ft UV Canopy comes standard with a black nylon bag which has a strap for carrying over the shoulder. An upgrade to our Casita Canopy bag with wheels allows easier transport where longer transport is required by foot, and an upgrade to our La Caja hard case with wheels is designed for shipping offers more protection with a solid, molded plastic construction. Sandbag Cover: This black nylon sand bag cover is used to protect your sand bag as well as to easily attach your sand bag to one leg of the Casita Canopy for added weight against wind. Included is the cover and hook. Do not fill this cover with sand. To use, slip hook through the grommet located on the handle of the cover and then close hook around leg of casita canopy. With the cover already on the ground, open velcro opening and place sand bag* inside the cover. Close velcro opening, and you're done. Lowest setting to peak 120.25"